Let your ten-speed live as God intended, with derailers and center pulls. As God Intended is a new segment on the OTSG where I will document my adventures with old ten speeds. I will be returning would be landfill-fixie-tallbike-bound 10-speeds back to their original department store glory and right in time for riding season. Watch out what you call a department store ten-speed. This Columbia is not likely one of these. Even bike shops had low-end ten speeds during the bike-boom days of the 1970s. My first 10-speed was an all-steel UJBBTS (Universal Japanese Bike Boom Ten Speed) that had only the word, “Premium” on the head badge. It weighed a ton, but had metallic green paint, shiny chrome pie plates, stem shifters, and cottered cranks. I paid $75 for mine. A Schwinn Varsity was about the same price, but was even heavier and had a one-piece crank. At this time in Los Angeles, a popular big box store was “Zody’s”. Here they had a very low end UJBBTS with down-tube shifters and cadmium plating instead of chrome on its pie plates, cranks, handlebar, stem, wheels, etc. You could score one of these beauties for $39.99, a bargain even for 1970. Sears had the Free Spirits, but those cost a lot more than $39.99. Auto parts stores (Pep Boys in L.A.) had their own line of ten-speeds as well as a line of parts and accessories. Today, here at the Bike Oven we rarely see anything but the better bikes sold at bike shops. Those Varsities were well made and are among the best survivors today. Columbia? A rare brand on the left coast and seldom seen today. Before posting this morning I did some research about Columbia and found their website, http://www.columbiamfginc.com. Apparently they still make bikes but have shifted their emphasis to school furniture. They don’t even offer a “road” bike in their current line, and I also couldn’t find anyone who carries new Columbias. I haven’t even been able to find any old ones on clist – now that’s saying something! Unfortunately, I didn’t experience the first bike boom, so I appreciate your input Harv. It’s so great what you’re doing. The fixie phenomenon breaks my heart … but it does preserve a lot of bikes that would go to the junkyard to undo and restore someday, doesn’t it? Just saw a CL posting on the OC fixie list where “dude” didn’t paint a fairly rare French Dynamax 10-speed the usual flat black because he thought it had “a lot of cool markings.” Currently restoring a mid-1980s Asahi and a ’75 Schwinn Continental myself. OK, new at this … I had a Dynamax back in early 60s but it was green when I purchased it new in NYC. Do you know anything about these bikes? I passed it onto my cousin after college and I think he pitched it not too long ago??? Did your green Dynamax have a “tour de France” decale on the top tube? I bought one of these bikes a few years ago from the thrift shop for $20. Don’t know exactly what to do with it, so it hangs in my garage. My wife had a 1972 Columbia 10 speed in college in the 70’s and has many fond memories of riding around SFA in Nacogdoches, Texas. 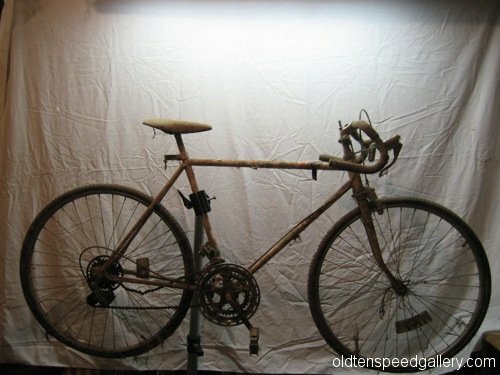 Around 1980 I had it completely tuned and restored at a local bike shop and packed it away in storage at the family farm. We forgot about it until yesterday. My son was looking at new 10 speed bikes for his treks around his college campus and it reminded me of the Columbia. I told him about it and he thought it would be interesting to check out bike 16 years older than him. He picked it up from the farm yesterday and it is in great shape. Although he might (temporairily) remove the original fenders and kick stand and replace the tires that are a tad dry rotted, it rides great. It’s almost like new. Good luck with your bike. I was thinking on posting my Men’s blue 10 speed Columbia bike on Craigslist soon. It has no rust & was always kept indoors, it may need new tires, but has been on the road with the current tires. I have personally owned it from new since 1975. Any idea on how much a bike of this sort would go for in today’s market? Anyone? I was thinking it didn’t have much value, but as I have seen from your site here how much it cost to renovate one if it is needed for some. It does have the racer handlebar curled under handlebar. Any feedback would be great. Thanks! wonder what the value is? I have a 1972 columbia ten speed that is in good condition. It was not ridden very much and was always stored inside. The last time it was ridden was in 1982.I pumped the original tires up today and rode it. As we said back then it just keeps on truckin. It has the double clutch breaks.Do you know the value?